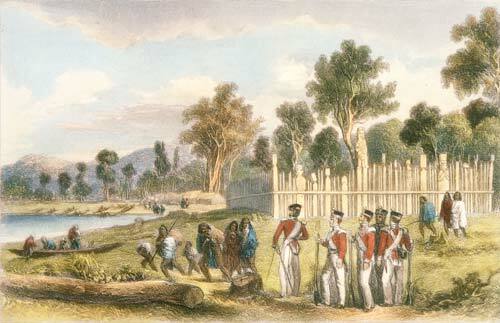 British redcoats and Māori stand outside Maraenuka pā in the Hutt Valley, the site of an 1846 dispute over land ownership. Violent disputes between Māori and Pākehā were common at the time, and settlers and British troops often came off worst, including in a serious defeat at Ōhaeawai, Northland, earlier in 1846. Britain supplied the new governor, George Grey, with sufficient British troops to force the issue when Ngāti Tama, led by Te Kāeaea (Taringakurī), and Ngāti Rangatahi, supported by Ngāti Toa leader Te Rangihaeata, refused to leave Maraenuka pā, which had been claimed for Pākehā settlement.